This is one of the most spectacular argands known that is executed in the gothic taste. 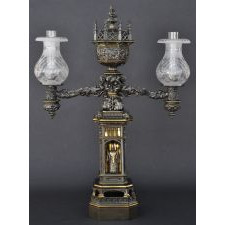 The entire lamp is beautifully presented in a patinated finish with gilt highlights. The font is topped by an octagonal shaped dome with a finial decorated with crockets. This is surrounded by a gallery pierced with open quatrefoils and separated by pinnacles. The arm decorations are cast in the form of winged creatures supporting the burner tubes with their mouths. The drip cups are cast with grape leaves and clusters. Pierced trefoils surround the shade holders. The eight-sided standard contains four niches with ecclesiastical figures. 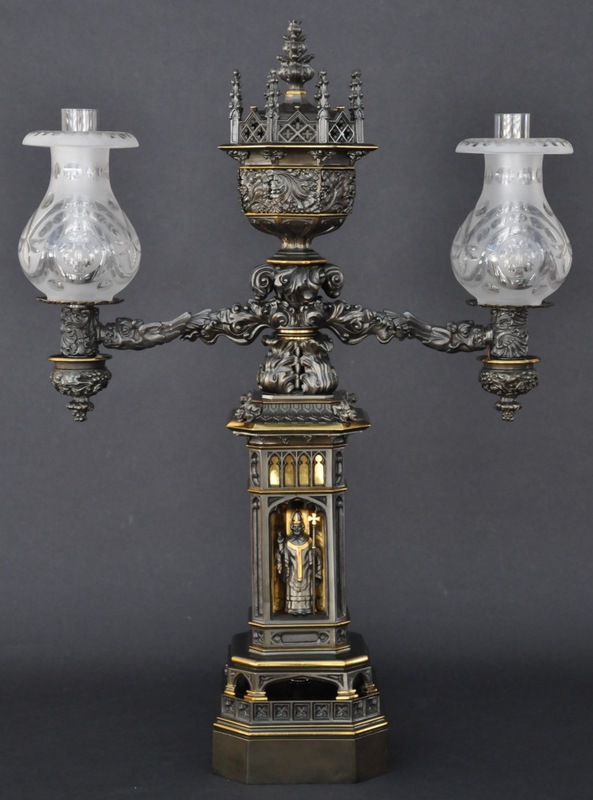 The lamp is supported by a conforming plinth composed of gothic arches and quatrefoils.